Welcome to Park Models Direct and our factory located sales center in Woodburn, Oregon. This location offers factory and model village tours 6 days a week and serves the following states: Oregon, Washington, Idaho. We have 20+ park model floor plans to choose from. All of our park model homes for sale come standard with name brand appliances and manufacturer’s warranty. Call today to learn more about our factory direct pricing or to make an appointment for a free guided factory tour. We have many floor plans to choose from. Here are some of our most popular models. Consider Park Models for the Perfect Retirement or Vacation Home. It’s hard to find a greater value or a better product than Park Models when it comes to bungalow, cabin, cottage, vacation and retirement housing. 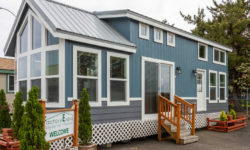 Compared to the Park Model’s larger and typically more expensive HUD cousin, RV Park Models, which cannot exceed 399 square feet, are compact, portable and far less expensive than traditional site built homes. Part of the exploding “Tiny Home” movement, Park Models are currently making a huge splash on the reality TV scene. These innovative shows feature down-sizing homebuyers looking for alternative solutions to site built housing. Campground owners like KOA and other outdoor-recreational enterprises are either filling their campgrounds with Park Models, or, are making their campsites Park Model compatible. And for the retiree set, there is no shortage of Park Model Communities cropping up in states with year round warm weather. Specializing in factory located sales centers, Park Models Direct, in conjunction with Factory Expo Home Centers, is the Nation’s largest and most successful independently owned retailer of Park Models, Mobile Homes and Manufactured Homes. Park Models Direct provides a great purchasing experience for homebuyers. Not only do our prospective buyers get to enjoy the most competitive, low pricing around, they’re also treated to factory tours and get to peruse fully furnished Park Models in our model village. They can even come back and observe their own homes during the construction process. Need more convincing? See what 12,000+ happy homebuyers have to say and check out our testimonial page for customer photos and honest reviews of the homebuying experience. Common Park Model standard features and upgrades include lofts, bay windows, clerestory windows, fully integrated covered porches, fireplaces, wood interior trim, name brand appliances, hardwood cabinets, stone siding, LED lighting and so much more! Development in the area of Park Model homes has been explosive in recent years and this segment is probably the hottest in the RV industry. Drawing inspiration from the cutting-edge technology and modern design used in the construction of today’s manufactured homes, Park Models are an exciting new option for today’s astute homebuyer.